First we need to film the left side of the screen. We’ll call this Clip 1. You can see my head in the lower righthand corner, but that’s alright. We are not using that half anyway. 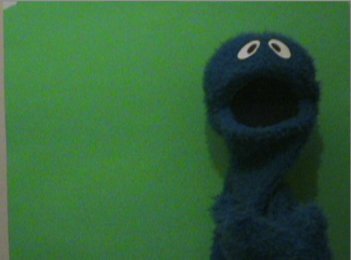 Second, we need to film the right side of the screen. We’ll call this Clip 2. And the last item we need is a matte that’s black on the left, white on the right, and a gray gradient in the middle. The red frame is not part of the matte. It’s just there in case you are reading this in an email or RSS reader that has a white background. And now it’s time to edit. 2) Create a matte track: Create a new video track and rename it to “matte”. Well, you don’t have to rename it but it helps prevent confusions. Drag the matte into this track. Make the track invisible by clicking the eye to the left of the name of the video track. 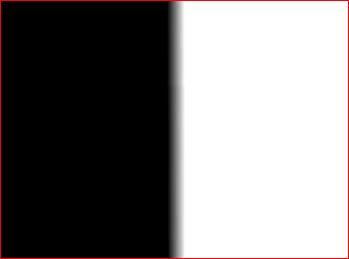 This is because while you want to use this matte, you don’t want the viewer to see all these black and white colors occupying the screen. They are there for a purpose, but not for viewing. So turn it invisible. 3) Apply the matte: To do this, go to Effects window. 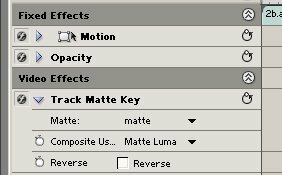 Under Video Effects => Keying, you will find Track Matte Key. Drag it into Clip 2’s Effect Control Window. 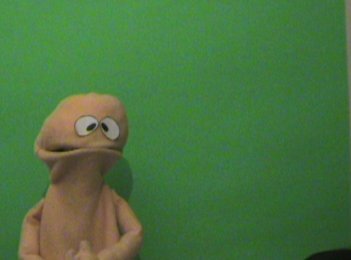 And then under “Matte”, choose the video track that the matte is sitting on (in this case, “matte”). And then for the composite option, choose “matte luma” (the default is probably “matte alpha”). We are deciding the transparency of the pixels based on how bright a pixel in the matte is. That’s why we use the matte luma option. PS. In case you are wondering, the “reverse” option reverses the matte. That is, black is now opaque and white is now transparent. 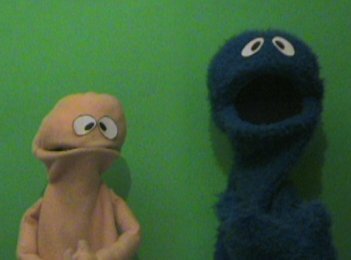 If you have the two clips in this current order, clicking on “reverse” will make the final result just the green background, since we are now showing the halves without the puppets. 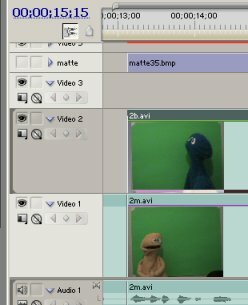 However, if you had put Clip 2 in video 1 and Clip 1 in video 2, this option will come in handy.